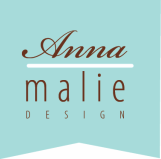 Welcome to Anna Malie Design. If you do not see a design that fits your needs, please contact us and we will work with you to make a design that is suitable for your needs. We require a $50 deposit to begin custom orders. Once this and your information is received, an electronic proof will be emailed. Once everything is perfect electronically and time permits, a hardcopy proof will be sent before a production. Orders must be paid in full before the hardcopy proof is mailed out. This shipping price listed is for 1 item. Shipping will be calculated depending on the amount of items ordered. The items will be shipped within 3-5 business days unless it is a custom order. Please allow 4-6 weeks for custom orders. Most of the shipping is handled through the United States Postal Service Priority Mail Service, which is a 2-3 business day service - however it is not guaranteed in this amount of time. We cannot guarantee anything. We will provide insurance on orders if requested by the buyer. We are not liable for any lost or stolen packages or damages that may occur during shipping. We do our best to properly package your goods and should there be an issue, we will work with you to come up with a solution. If another shipping service is desired, buyer can request it and buyer is responsible for any additional fees for the service. Non-customized items may be returned within 7 days of receiving. You must contact us if you are wanting a refund before you return it in order to get a refund. Unfortunately custom items may not be returned. If there is a problem, and you are unhappy with your purchase, please contact us and we will work something out. Purchaser is responsible for all shipping fees. You must contact us within 5 days of receiving your order. We are not responsible for misspellings in approved proofs, so be sure to check and double-check your proofs over carefully for spellings, punctuation, capitalization and grammar. It also helps to have a fresh set of eyes look over your proofs for any mistakes. Returns based on color are not accepted. All computer monitors are different, so your printed stationery may not match what you see on your monitor. Due to the custom nature of printing, these colors can vary over time and may not match perfectly. I highly suggest obtaining a complimentary hardcopy proof of your invitation (if proper time is allowed). If you see an item you like, contact us we will make a custom listing for you to purchase in the amount you need. Please note, colors may vary from your from our screen to yours and we are not responsible. Some assembly may be required with belly bands and tags. It is up to the customer to supply postage and to calculate how much postage is needed for their invitation and to test their address labels to make sure they comply with any United States Postal Service regulations. Please note, I have the right to list your custom work for sale after your order. Prices are subject to change.